The Texas Star Rosette© is a unique cornerblock for use with case moulding around doorways and windows. These rosettes add detail to your home and help to distinguish it from the others, and their timeless "Texas Star" pattern complement many styles of homes, from old restored ones to modern new ones. Texas Star Rosettes© are available in standard 3 3/4" and 5 3/8" sizes for compatibility with common 3" and 5" paint-grade case moulding. They are made of semi-flexible plastic/resin compound which can be easily nailed or glued into place and painted to match adjoining trimwork. These rosettes have proven to be a popular product with Texas home builders who wish to distinguish their homes with a touch of classical Texas style. If you prefer natural-finished or stained wood trim in your home, we can also provide real wood Texas Star Rosettes © . Natural wood rosettes are individually hand-made and can be constructed from nearly any desired wood type. Please email us for a price quote if you are interested in these. We are currently developing new products for the Texas Star line of home decoration products. 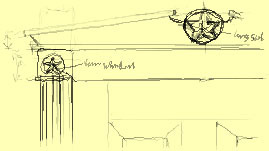 Our next planned product is a doorway pediment kit, similar to the sketch at the right. We are also assembling a complete doorway/window decoration kit which will include all the necessary moulding for a window or doorway in one simple package.